Natalie Cummings hates being a Hollywood call girl. She would’ve given anything to be an educated professional woman. When an opportunity presents itself to change her occupation, she grabs it, even though it means keeping a secret for the rest of her life. Following an ad in a newspaper, Natalie accepts a job as a chaperone for two teenaged girls on their prolonged vacation in Europe. Natalie is ecstatic, however soon her enthusiasm is rudely shaken: the young girls from good Los Angeles families are not what they were supposed to be. They are wicked. As Natalie battles with the girls on their travels through Europe, there are three men who influence their lives—for good or evil. When the travelers finally return to America, one of them arrives with a baby . 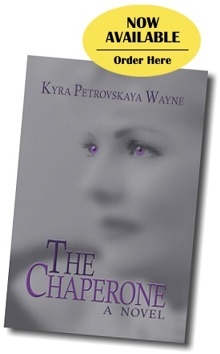 . .
Kyra Petrovskaya Wayne is a descendant of one of the ancient Russian noble families. She is a decorated survivor of the Siege of Leningrad and an award-winning author of thirteen books. She lives in the middle of a forest in the State of Washington, surrounded by her family, Old Master paintings and hundreds of books. Reviewd on a scale from 1 to 5 with 1 meaning “poor” and 5 meaning “excellent”. A most unusual plot, the idea of a call girl taking on the job of chaperone for two teenage girls. These girls are more than Natalie, the heroine expected. All of the characters are three-dimensional and unusual. The story has many layers and surprises along the way, with a good helping of romance. Thje dialogue is most-definitely realistic, reveals character and moves the plot along. All the settings, and there are many, are well-described. the ending is a big surprise. Good job. The Chaperone would make a good movie. No suggestions, the author did a great job—unique plot, good writing. Hopefully, the promotion plan is also good: booksignings, presentations for libraries, book clubs, service and social groups, and exploit the Internet. 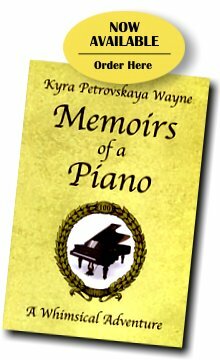 A whimsical chronicle of the vicissitudes of fortune of a French piano during more than a century of historical upheavals. In its own words, the piano tells us how it had ended up on the barricades during the French Commune. It describes its encounters with Franz Liszt and Camille Saint-Saence, its meeting with young prodigy Claude Debussy with whom it travels to Russia.